The GNLU Journal of Law, Development and Politics (GJLDP) is a biannual, interdisciplinary journal which focuses on law, development and politics; is published by the Editorial Board of Gujarat National Law University and is administered by faculty and students of the University. The purpose of GJLDP is to provide readers with information on recent developments affecting laws, development and various political issues. 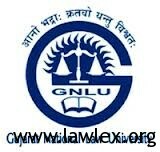 The GNLU Journal of Law, Development and Politics (GJLDP) invites papers for its biannual journal to be published by the Editorial Board of GNLU. Manuscripts should be submitted in Garamond, with font size 12, line spacing 1.5′; justified, with sufficient margins of 1.5″ to the left and 1.0″ on all sides. The author(s) is/are required to submit a covering letter containing all personal details (Name, Designation, Name of College/University/Institution, Postal Address, Phone Number and E-mail ID) in separate sheet. Title page with full title and subtitle (if any). For the purposes of blind reviewing, full name of each author with current affiliation and full address/phone/ fax/email details plus short biographical note should be supplied on a separate document/sheet. The Manuscript should not contain any identification of the author/s, which shall be ground for rejection of the submission. Citation: End notes, but not footnotes, may be used if necessary and should be signaled by superscript numbers in the main text and listed at the end of the text before the references. The citation format to be used is Chicago Manual, 15th Edition, while for legal citation the Harvard Bluebook style of Citation, 19th Edition. Tables: tables should be supplied separately from the text in Microsoft Word and their position indicated in the text. All tables should have short descriptive captions with footnotes and their source(s) typed below the tables. Illustrations: all line diagrams and photographs are termed ‘Figures’ and should be referred to as such in the Manuscript. They should be numbered consecutively. Line diagrams should be presented in a form suitable for immediate reproduction (i.e. not requiring redrawing), each on a separate A4 sheet or separate file. They should be reproducible. Authors are responsible for obtaining permissions from copyright holders for reproducing any illustrations, tables, figures or lengthy quotations previously published elsewhere. Permission letters must be supplied to Editorial Board. The GJLDP accepts Manuscript for publication on a rolling base. Manuscript accepted can take up to six months or even more to be published in the Journal. Papers with immediate relevance would be considered for early publication. This is matter of editorial judgment.